Your opportunity is here! 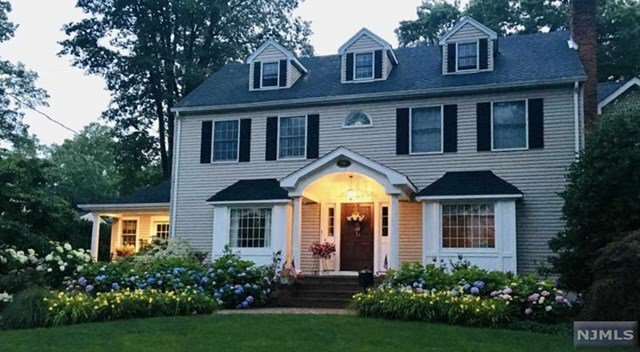 A rare gem of a Colonial in the Ramsey Golf and Country Club "clubside" on an oversized lot. This home has been lovingly updated to include 3-4 bedrooms, 2 1/2 baths, 2 gas fireplaces in formal living room and family room, study/office/bedroom on first level, dining room, gorgeous eat-in kitchen with french sliding doors to your tiered slate patios. Second floor includes a true Master Bedroom with private bath, 2 more bedrooms and bath. The third floor is a walk up attic partially finished so you can finish the room to your taste. A finished basement, garage and storage on lowest level. The home includes central air, central vacuum, hardwood floors and carpeting. Professionally landscaped with in-ground sprinklers and ready to enjoy all seasons. It is within walking distance to all the Club has to offer plus downtown and train station.